BGR has been helping local partners feed 4,500 Guatemalan families after the Fuego volcano erupted on June 3. The disaster killed roughly 165 people and more than 250 are still missing. It forced thousands from their homes. 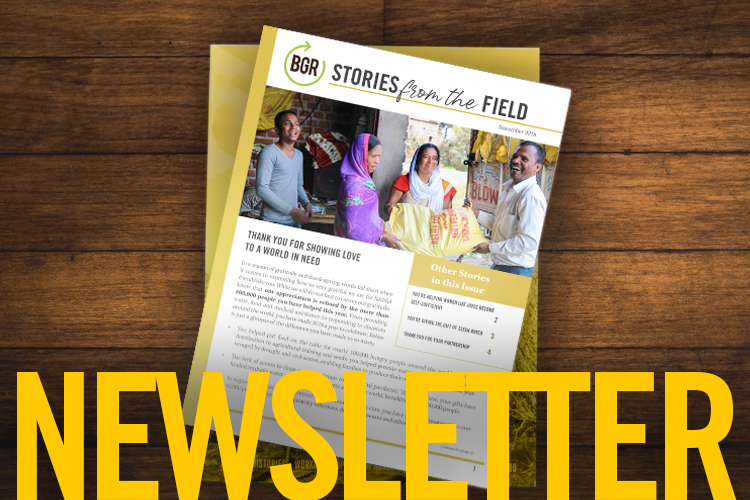 Local churches have been coordinating assistance, including BGR food relief, and they are currently delivering food to displaced families in ten communities every eight days. BGR outfitted one church with a stocked refrigerator and two freezers, as well, to help it serve meals. Compassionate Guatemalans also stepped up to care for their own. Our organization had planned to distribute hygiene kits along with the food relief, but nationals donated the items instead. Others gave wheelchairs, roofing, a water tank, a corn grinder, and beds. A local nurse also set up a pharmacy in a church and distributed donated medication, and a local doctor provided survivors with exams. As initial disaster response efforts end, BGR will begin its second phase of recovery, which includes replacing destroyed water pipes in three communities, distributing coffee plants and seeds in a farming village, continuing food assistance through the end of September, and starting a chicken project to boost a village’s food security. Please continue praying for volcano survivors and for the BGR projects that are helping them recover.